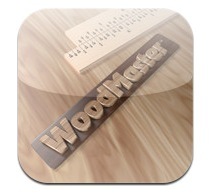 Woodmaster is quite expensive (for an app) at $7.99. I’m willing to pay that – if that app is good. Unfortunately, WoodMaster falls short, but had a lot of promise. The good news: good interface, great graphics, and a good assortment of applications. The bad news: interface falls flat in some places, and applications I don’t think most would want. In calculating fractions (as in, 1 5/8″ + 17 19/16″), the author thought an impossible to see slide ruler would be a good idea, with Fraction Calculator (Sliderule version). The tick marks are illegible, and who uses a slide rule anymore? What’s the benefit of going analog on a digital device? There is none. The Fraction Calc (Numeric) is much better, and does the job. The Board Foot Calc is fine, and lets you not just calculate BF, but add to a tally. Good. The Fraction to Dec & mm convertor would be much more useful if we could include inches! As it is, you can just convert fractions of an inch to a decimal and mm equivalent. Great, 21/32″ is 16.7 mms, but how many mms is 5 3/4″? Put an inch wheel in there as well. Length Conversions, from English to Metric, and vice versa, is fine. Proportionnal Calculator could have been much better. This tool is supposed to be for those times when you are scaling – such as making a table 3/4 scale of the original. If the original length of a piece was 32 3/16″ long by 6″ wide by 1″ thick, what would the size at 3/4s? This won’t tell you. You can’t enter fractions, and the interface is confusing. From what I could figure out (even after reading directions), you enter the original width and height, as well as the new width or new height; the calculator will figure out the new width or height – whatever was missing. Not really helpful. The Golden Ratio calculator could also be better. Again, you can’t enter a fraction, and maybe you don’t really need to, as this is a matter of design, not exact measurement This calculator simply gives you a ratio on a board. For example, if I enter 5 as the dimension, the Golden Ratio is 3.09 and 1.91. As a woodworker, what the heck is 3.09 and 1.91 in terms of inches?! How is that useful to me? It’s fine if you want this calculator in here, i can see a possible use for it, but jeez, make the resulting calculation usable! A useful calculator for a carpenter app would be the Nominal to Actual Size calculator. This converts stated sizes to real sizes. In other words, a 2×4 is not actually 2″ x 4″, it’s actually 1 1/2″ x 3 1/2″. Not sure when I would use that as a woodworker, as I rarely use construction grade lumber. Screw sizes is a reference chart. For instance, if you are using a #3 screw, the head bore is 13/64″, the shank hole is 7/64, and the pilot hole should be 1/16″ For me, that’s handy, because I’m forever using calipers to measure a screw’s shank (as opposed to the thread width) to determine the size of pilot hole I should be drilling. Nail Sizes is just a reference chart – “How big are 2d nails? – 1 inch. That’s fine to have. Joint Types enlists beautiful graphics to illustrate different fairly common joints. It’s a slide side-to-side type presentation; perhaps a listing view would be better? Instead of just the name of a joint, maybe include benefits and disadvantages of that type of joint? Wood Types is simply a graphical listing of various woods, ostensibly for identification purposes. Knock Down Sawhorse and Knock down Workbench are nicely illustrated graphical plans that can be emailed to you. I could do without this. Project Planner is a nice little planner you can have sent to you for printing out. Again, not really needed? To sum up, WoodMaster, is an app that has some promise, but at this point, doesn’t live up to it’s high price. Some moderate revising would make it a good app – but at half the price.